On October 6th, 2018, Ward Melville had their annual homecoming festival along with their highly anticipated football game against Walt Whitman High School. 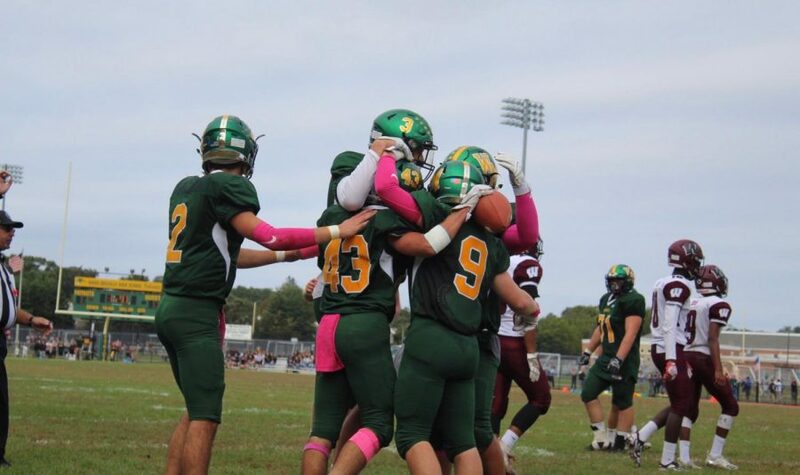 Coming into this game, Ward Melville’s football team were flying high as they picked up wins against Sachem North, Sachem East, Connetquot and Patchogue-Medford to start off their season undefeated. Not only did they win all those games but they did so reasonably comfortably as they always maintained a lead of at least two touchdowns or more against all their opposition. But all those stats become irrelevant when it comes to game day. In the game, the Walt Whitman football team was off to a neutral start. They won their first two games at home against Brentwood and Sachem North, but away from home it was a different story, as they later lost to Bayshore and Connetquot. Last year, the Ward Melville football team had the upper hand in the rivalry, as the Patriots managed to get a 41-7 win last year at Walt Whitman’s home field. At least a thousand people were packed into the bleachers and around the football field as they took in the electric atmosphere created by not only the game but also the homecoming festival. As the 1st quarter got underway Ward Melville took immediate charge of the game, scoring a touchdown and also secured the two-point conversion to start off the game 8-0. Going into the second quarter Walt Whitman looked a lot sharper but were unable to secure a touchdown as they settled for a field goal instead, with the score reading 8-3. Ward Melville stopped any momentum for Walt Whitman, as they countered back with a touchdown right before halftime to secure themselves a two-touchdown lead over Walt Whitman (14-3). After an entertaining halftime show, which included the Ward Melville marching band, the Three Village cheerleaders, and a walk around the track by elementary school kids supporting the WM team, the game resumed. The 3rd quarter was definitely the worst of the day for Ward Melville. It started off rough as Ward Melville fumbled the ball into Walt Whitman’s end zone and let them secure a touchdown. Walt Whitman also went on to score another a field goal, giving them momentum with the two sides only separated by 4 points (14-10). Things weren’t looking good for Melville until with only 3 minutes remaining in the quarter, Ward Melville pulled off another touchdown to once again obtain a clear advantage in the game (20-10). The 4th and final quarter was where Ward Melville sealed the game. Early in the 4th quarter, Ward Melville got another touchdown thanks to a fantastic 18-yard run made by Nick Troy. Defensively, the team was solid and didn’t allow any points scored in the fourth quarter. The final dagger came when Melville scored the final touchdown with 3 minutes remaining, ending the game 32-10. This historic start for Ward Melville football continues their unbeaten run with a record of 5-0, the first time since 1974. In an interview with Nick Troy, Troy said that “the team started slow but eventually we brought it together.” He also mentioned that “it wasn’t the prettiest of victories but what’s important is that the team got the win”. Nick emphasized the importance of the teamwork in the victory. Next up, Ward Melville faces off against undefeated William Floyd High School, the toughest test for the WM football team this season.